Emem Usoro is an alumna of Harvard Business School and Lagos Business School. Her banking career spans over 20 years with experience in Operations, Credit and Marketing, Branch Management, Relationship Management, Corporate and Commercial Banking. 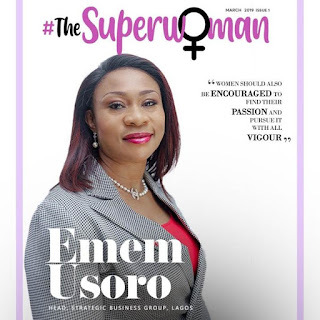 Emem was the Group General Manager and the Strategic Business Group (SBG) Head, Abuja. She is currently the Regional Head, Lagos Bank 2. She has won multiple awards at the annual UBA CEO Awards. It’s hard to be a woman and it’s awesome being a woman, there are pros and cons to being a successful career woman. I would say trying to maintain a balance between my professional life and family. I have had to juggle my career while trying to raise my kids in the same state especially because relocation is part of the game and it’s difficult to compete with a man who has no limitation in this space. However, working hard on how to fit in and adding value in multiple ways has always made up for this limitation. The great thing is I work for an organisation that supports women and is mindful of our decisions. One thing that keeps resonating is thriving in a male dominated organization. You would agree with me that while the world is evolving, women are still lagging behind when it comes to leadership roles. Our gender has absolutely nothing to do with the quality of our work, in fact it has little to do with anything. My advice to other women at the top is not to be set back by gender, know that you belong in the team and actively add value in as many ways as you can. •After all the success in your career, what keeps you going or inspires to do more? Success is personal, they are varieties of things that matter to people, it could be title, purpose, values, vision or mission. For me it’s my purpose and I have always known that people with a sense of purpose tend to succeed. What keeps me going is that I have tried to reframe any negative emotions as a positive one and I never allow negative emotions take control of me. I never spend my emotional energy in fears, I just step in and I do whatever I believe in to make things positive. Secondly, I never get stuck on doing the same thing, it’s about personal reinvention, we need to re-invent ourselves so we don’t get bored. I love investing my time in things that really matter to me. Lastly, I love to make big bets and decisions of what I want to do and where I want to get to. You’ve got to be totally in sync if you choose to work or stay at home. Seeing that UBA has a strong female representation in Executive management positions, I am optimistic this would change with policy makers encouraging inclusiveness and diversity. Women should play the activist role, when there is an opening we should encourage and have women participation. Remember, we rise by lifting others. Women should also be encouraged to find their passion and pursue it with all vigour. They should lend a voice to the issues they feel strongly about and open doors for other women to come in.